Are you feel your fingers will be tired after the long-time gaming? Are you worried your character would be death due to a small misoperation?Don't worried, your fingers of both hands will be very comfortable after you use our PUBG mobile controller, and the stick-on joystick solves the problem of the clumsiness of the on-screen control,make your character's motion more precisely. -Perfect Size：The telescopic boom design allows our android gaming controller to adapt to any size of the smart phone, even it with an smart phone case. -Ergonomic Design：The design of mobile gamepad is ergonomic,it can give you the best touch screen gaming feeling. 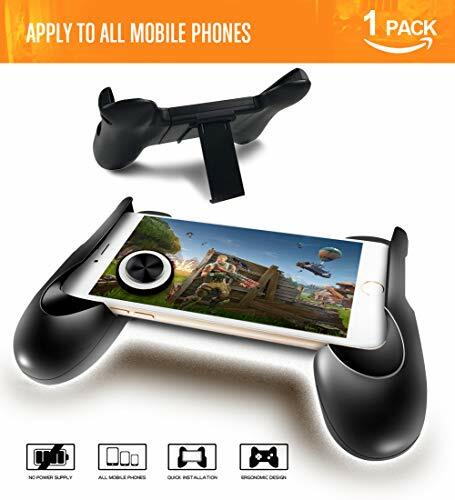 -With Kickstand: The back of PUBG mobile controller has a kickstand,you can set your phone on the desk to watch videos, listen to music or make video chats. -Anti Slip: The surface of android gaming controller has sponge mat that can protect the back of the smart phone and prevent the fall of the phone. - Cooling Feature: The back of the mobile gamepad is not blocked, you needn't worry about the cell phone cooling problem! - High Sensitivity: With the conductive steel piece,our joystick can bring you a excellent responsive. - Adjustable Position: According to your personal habit to place the joystick on a proper place. - Absorbs Sweat: Due to the absorbs sweat feature,your screen will keep dry even your hand get wet. - Multi-purpose: Perfect for any game that has an on-screen control pad such as Pubg games, Fortnite, Mobile Legends, Arena of Valor, FIFA, Dragon Nest SEA, GTA and etc. Product Size: The size of this android gaming controller is 5.9 x 3.8 x 1.6 inches. Color: Black is our mobile gamepad's color. Material : Our PUBG mobile controller adopts ABS material. ❤【adjustable size】- The design of our PUBG mobile controller is telescopic,which allows this android gaming controller can compatible with all kinds of touch-screen smart phone,even it's with a smart phone case.Due to stretch freely,our mobile gamepad for mobile phone can up to 4.5-6.5inches. ❤【Ergonomic Grip】- The PUBG mobile controller has an ergonomic design gives you best touch screen gaming feel and comfortable feeling to relax your hand fatigue for the long-time gaming.The weight and the size of this android gaming controller feels quite balanced and you won't feel finger numbness because of it's ergonomic handle. ❤【Excellent operate】- The conductive stick-on joystick gives players the great physical manipulation, providing precise controlling on the in-game characters, and can deal easier with more complex positioning. The mobile gamepad's joystick with anti-slip design enables you to play effortlessly in 360 degree. ❤【Well Made】- With the conductive steel piece inside of the rubber pad,our PUBG mobile controller's joystick can bring you a excellent responsive during the game. Our android gaming controller is manufacture with high quality ABS material,this kind of material can made this mobile gamepad more durable and sturdy than other similar items. If you have any questions about this product by LEIIAO, contact us by completing and submitting the form below. If you are looking for a specif part number, please include it with your message.